In partnership with the New York City Mayor’s Office of Sustainability and the NYU Center for Urban Science and Progress, we’ve combined the New York City building benchmarking data with building auditing data that reveal the systems, fuel types and materials used in thousands of NYC buildings. 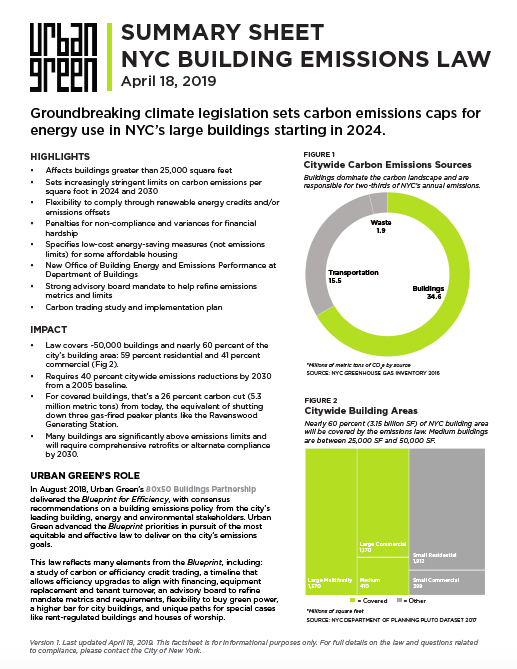 Below are a few facts from our report, but download the PDF for the full story on how our city's buildings really work and see coverage of the report in the New York Daily News. The buildings studied in this report make up 42 percent of New York City’s total floor area—roughly 2.3 billion square feet. That’s an area larger than Manhattan and Staten Island combined. Collected under Local Laws 84 and 87, this data shows not only the amount of energy and water used by our buildings, but also how they’re using it. It is only by knowing this information that we can uncover how to use less. Space heating is New York's largest single energy demand. Auditing data helps us track the flow from energy sources, through the building types that use them, to the heating systems in those buildings and how that heat is distributed. Multifamily and office buildings are responsible for 87 percent of energy use in benchmarked buildings. Multifamily housing alone—large apartment complexes and similar buildings—make up nearly 70 percent of total floor area and use over half of all the energy consumed by benchmarked buildings. See how other building types stack up in the report. Please note that the number of properties and the cleaning methodology used varied from year to year. 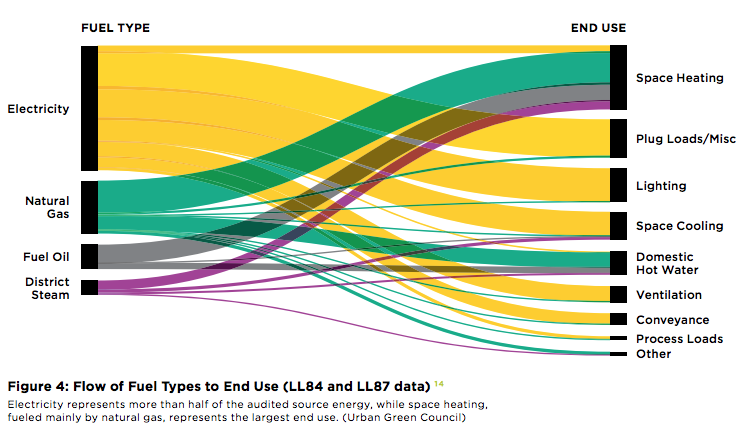 For example, since the 2013 and 2010 data sets analyzed fewer buildings, the total energy usage is lower but that does not indicate that the sector decreased usage citywide. Thanks to data collected as a result of Local Laws 84 and 87, we know that New York City's largest buildings have cut their carbon emissions by eight percent. That’s significant, but it shows there is more work to be done to hit the city's 80 percent overall reduction target by 2050. While the citywide ENERGY STAR Score (of 74) is well above the median (of 50), we still have a ways to go to catch up with other urban areas that benchmark. Here are the top three ways that we can improve buildings based on the data. See the full list in our report. 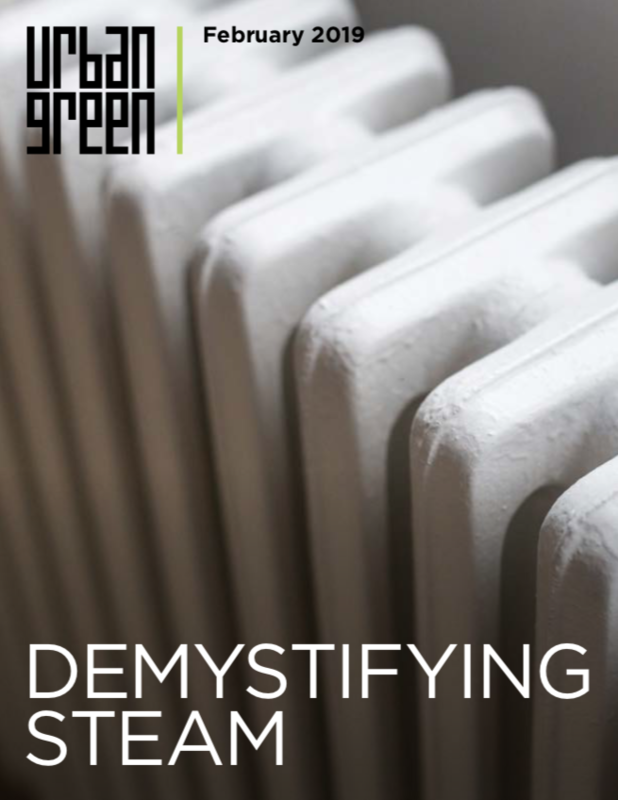 Improve heating efficiency: refurbishing and replacing steam heating systems can yield deep energy savings. Reduce energy loss from ACs: Leaks from window and wall air-conditioning units—roughly equivalent to punching a six-square-inch hole in your wall—are costing building owners up to $180 million every year. Update lighting: Roughly 40 percent of multifamily buildings and 25 percent of offices are lit by older, inefficient and poorly controlled systems. Dive into our analysis of each of these issues and see our full list of recommendations in the report PDF. Please note that these percentages are estimates.